Pretty good animation, but it's really really slow. And that song is mostly associated with the "indestructable" fad. Good animation, but u need to edit out some frames and scale i down a bit to make it smaller and run faster. and yes, i have a fast machine. good job though! "associated with" ... don't f*ck w/ our worlds people. though, i believe the rammstein song has been used for destructible fads as well. i also see a fad. this has became one of my favorite ytmnds. sh*tty quality and overused sound. And Mario... Transforms into.. coins.. yes, it all makes sense since he collects them!! Okay... anyway! Still cool! the rammstein song was a better fit..
Two excellent N64 YTMNDs on the top 15 today. Awesome. Use the image text option, the plain text is slowing your gif down. This wins. I like the Fire fight song with it. My fad senses are tingling. Blaster, that's what Spiderman was owned by! It's not working at the moment... This sounds promising, though, so I'll hold off voting till it works for me. I didn't find it funny, but still, nice work! Not really. At least Spiderman survived. Leave out the aiming part. It'd go much better I think. Oh, you mean "pwned". I was thinking of property ownership as I was clicking. add the mario "COIN NOISE" when it hits! The image is great, but the audio is a NO. 5'd, but get different music. The Peach's Castle music from SSBM would work here. I'm sure some site out there has it. Good job, though. I laughed. lol you got something going here! -1 for Prodigy. I'm not a big fan of their music. Everything else is great, though. 5 for good edit and Prodigy. I think it would've been better as Sonic, since Sonic is the one who has coins fly everywhere when he gets hit. Funny though. Apparently mario turns into coins when he hits things. we dont know why mario turns into coins. and we dont know what this song has to do with anything. Nice stuff, i love the coins coming out lol. But new music maybe. that's how spiderman got crippled! Raised to 5 for speeded up image, very well done. looks great. 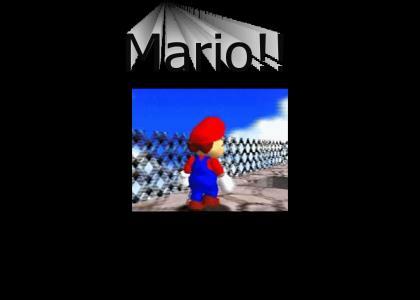 +5 for disintigrated Mario, -1 for slow image. Improve the speed for your final star. Very inventive, and +1 for using Firestarter, but -1 for the lag in the latter part of the animation (after mario gets in the cannon) 4 Stars. Sort the animation out for the big 5. Oh man, that is freaking brilliant. "Firestarter" sounds like "five star-er"
That's mario and spiderman alright. Unfortunately, it's just not funny. Awesome, and may I just say... f*ck THE DOWNVOTERS!! lol nice. 4----->5 for the edit. will give a five if you put Weird al's parody of the song called "haircut"
Why does everyone keep saying Mario "turns" into coins? You can see Mario flip backward after shoryuken-ing Spiderman. Mario doesn't turn into anything. I like the update even more. Pre-pubescent downvoters, beware. +5 for great content, -1 for totally gay music. lol. 5'd for not taking out the coins. You get the fifth star because Mario no longer disintegrates. 1 for using P O D god I thought I would never have to hear them ever again. Whoever says this isn't funny, just wishes they could do this good themselves. 4'd 404 good song not found. Mario got 120 stars. You only get 5.
plz report to YTMND base camp for training to be teh funny. this is not. This is easily one of the best things ever. Good work, you could've used a better sound clip. HE JUST STOLE DAT GUY'S PIZZAS!!!!!!!!!!!!!!!!!!!!!!!!!!!!!!!!!!!!!!!!!!!!!!!!!!!!!!!!!!!!!!!!!!!!!!!!!!!!!!!!!!!!!!!!!!!!!!!!!!!!!!!!!!!!!!!!!!!!!!!!!!!!!!!!!!!!!!!!!!!!!!!!!!!!!!!!!!!!!!!!!!!!!!!!!!!!!!!!!!!!!!!!!!!!!!!!!!!!!!!!!!!!!!!!!!!!!!!!!!!!!!!!!!!!!!!!!!!!!!!!!!!!!!!!!!!!!!!!!!!!!!!!!!!!!!!!!!!!!!!!!!!!!!!!!!!!!!!!!!!!!!!!!!!!!!!!!!!!!!!!!!!!!!!!!!!!!!!!!!!!!!!!!!!!!!!!!!!!!!!!!!!!!!!!!!!!!!!!!!!!!!!!!!!!!!!!!!!!!!!!!!!!!!!!!!!!!!!!!!!!!!!!!!!!!!!!!!!!!!!!!!!!!!!!!!!!!!!!!!!!!!!!!!!!!!!!!!!!!!!!!! oh , MY, GAWD!!!!! NINTENDO SIXTY FOUUUURRR!!!!! now THAT's a money shot ! Works so well on so many levels! Pity random retards keep taking the piss. If you don't know what you're talking about, don't downvote it because of this. I may have to go through downvoter's YTMNDs and 1-star 'em all. That was more epic than my left ventricle.